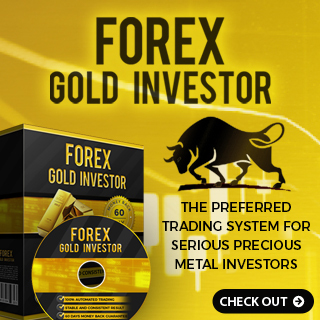 MetaTrader 4 User Guide - Terminal - Find the best FOREX Brokers, FOREX Bonuses, FOREX Signals, FOREX News, FOREX Rates and everything FOREX related on Forex Directory! The "Terminal" is shown at the bottom of the screen with a number of tabs which represent different functions and information. 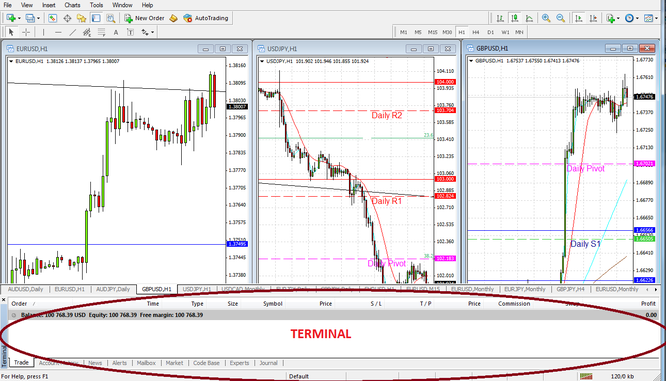 At the Terminal trades are executed. The location of the terminal and its tabs is shown in the diagram below. The "Trade" tab displays in its window any trades which you have open and all the current information which are relating to the positions of each trade. 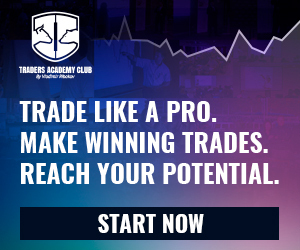 The "Account History" tab shows the history of closed trades with the significant information which are relating to each trade. Your broker may send you news which they consider relevant to the Forex market. These items are listed and the contents of each can be viewed by clicking on a particular item within the list in the "New" tab. You have the possibility to create alerts within Metatrader to alert you to particular price events that you want to have a look at. 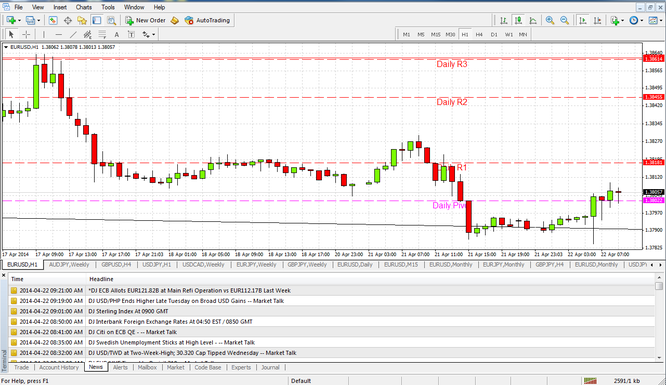 Pending and triggered alerts are shown here. New alerts can be created by right-clicking your mouse within the terminal window if the Alert tab is on then you have to click on “Create” which will bring the dialog box for the creation or editing of alerts. It is shown in the image below. Please note that alerts can be set to include a sound alert format that can be useful. 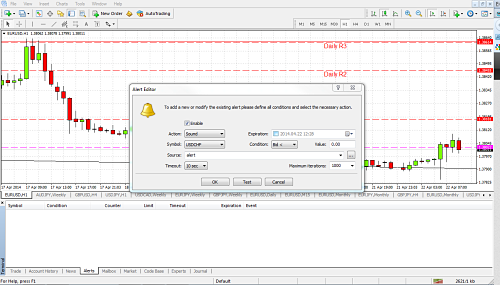 Metatrader 4 has a "Mailbox" function which can be located here although functionality is limited to receiving messages and replying to them only. 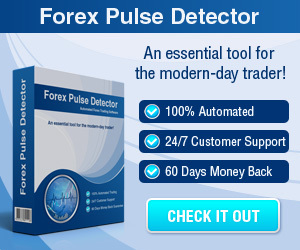 Some Forex Brokers offer a range of trading-related products for sale in the "Market" tab. By clicking on this tab it will bring up a range of icons which represent products that can be purchased. 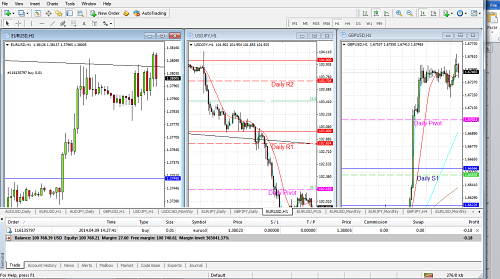 The "MQL4 Code Base" shows a current list of free Expert Advisors and Indicators which have been posted to the Metatrader Community. They include a description of the purpose and use of each. The "Expert" tab displays a log of the operation of any Expert Advisors which you have attached to your Metatrader Platform. 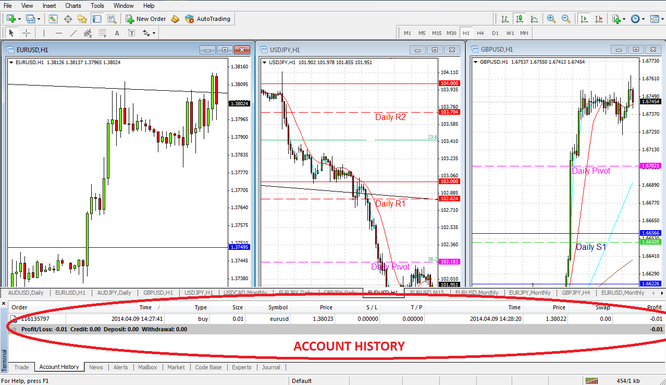 The "Journal" tab shows you a journal of all your activity within your Metatrader Platform.